Well, stick a needle in me. Or forty. As I laid on my chest with needles sticking into my shoulders, the Chinese lady said, “I’m going to hook these up to electricity, ok?” I tried to nod, but couldn’t with my face snug in the massage table frame, so instead I said, “Ok, yeah, sure,” which just goes to show how awful my never-ending headache has become. Not only did I let a woman I had just met who spoke in a thick accent I only 88% understood send electricity through needles she had stuck in my back, I paid her to do it. Last Thursday I had acupuncture. It’s one of about three dozen things on my checklist called: “Things that might cure the headache, but probably won’t, yet I still have to spend thousands of dollars on just to make sure.” I am not a big believer in Western Eastern healing arts, however I do believe acupuncture is sometimes effective in relieving pain, even if we don’t know exactly why. There have been studies that have shown it’s better than a placebo, one of which I saw reported on the nightly news the week before, which reminded me that, oh yeah, I needed to find an acupuncturist and get some needles jabbed in my head already. One of the most trying things about my headache is trying to locate legitimate, competent healthcare professionals in the fields I’m exploring. Exactly how do you find an acupuncturist who won’t bleed you with rusty nails? And how do you find a chiropractor that won’t break your neck? Most people ask their friends for recommendations, but none of my friends were of any help, so I’ve been using the Internet. I check out practitioner’s web pages, see if they have accreditations or if they belong to professional organizations, check for any other references and ask how long they’ve been practicing. Then I just jump in and hope they don’t kill me, or if they do, they do it quickly so I can stop being in pain all the time. When I called the acupuncturist, all she asked for was my name, phone number and what time I wanted an appointment. I loved this. When I called the allergists right before her, they made me give them my birth date, social security number, insurance information, home and cell and work phone numbers, and emergency contact information. They got everything but my jeans size. Alas, the acupuncturist was saving all these questions for the new patient form I had to fill out in the lobby upon arrival (except for the jeans size). This is the other trying thing about my headache: I have to fill out lots of forms. Over and over and over again. If hell exists, it consists of me, sitting in a medical office lobby, filling out a 500 page form which includes the same questions on every page. Did you paternal grandmother have diabetes? Well, did she? Did she?! We have to know or we won’t be able to treat you!! Now circle the area on the figure where you have pain. Do it! Do it now!! I wasn’t sure what to expect at the acupuncturist, but she had a distinctly medical vibe going on. Her lobby was like any doctor’s lobby. 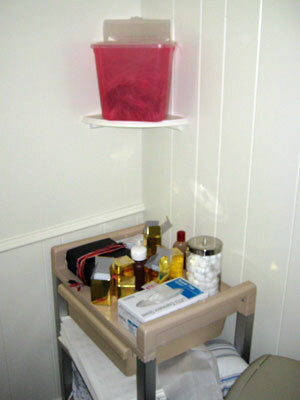 The treatment room had sterile white sheets and standard office decorations. There were posters on the walls and medical supplies in the corner. She even wore a white lab coat, which made me feel better even though I knew she was wearing it solely because it would make me feel better and not because she was actually a doctor. I talked to her for a couple minutes about my problem as she went over my forms. Then I put on a medical gown and laid on my chest. She pressed on places on my shoulder and asked if this was where I ached. If I said yes, she then positioned the needle above the spot and – TAP – inserted the needle into my skin with a swift motion. Then she asked if I could feel the needle. Most of the time I could not, except for the moment when it was inserted. “Tell me when it starts to vibrate,” she said as she turned a knob (I assumed, as I could not see her). “I don’t feel any – oh, ok, yeah!” I said as the needles started to vibrate pleasantly on my right side. Then she repeated the procedure on the left. “Ok, I’ll be back in 15 minutes,” she said and then left the room. Leaving me alone. With needles in my back. Plugged into an electric socket. In the dark. With Muzak. Which left me plenty of time to wonder how I’d gotten myself into this situation. “Sorry, no.” I felt basically the same, though slightly buzzed or dizzy. I hate letting my healers down like this. I know it’s not my fault. They want me to get better and I want to get better for them, but it never happens. It’s been eight months. I doubt I’m ever going to get better. So I scheduled one more appointment, just to give it another shot. But after that, I’ll probably leave the needles to my sewing kit. Later: What’s a Tuesday without a massive server failure? As I understand it, acupuncture is a process . . . not something that can create a huge benefit in just one or two visits. Maybe I’m wrong? 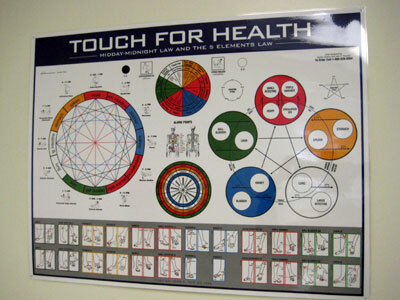 Anyway, I’ve been seeing an acupuncturist, as well . . . and taking Chinese herbs (in the form of a horrendous tea), and making some of the dietary changes she recommended. And I don’t know if it’s fixing the primary stuff that I went in there for, but I can definitely tell it’s helping me in other ways—not the least of which is I have major, major, trippy endorphin highs when I leave there that help me have clarity about my life in general. I get you on the cost—it’s painful to pay entirely out of pocket, as I do, too—but I figure it’s a waste of my money not to give it what is considered a normal course of time (several months, as I understand it) to see if it works. Eight months is a LONG time. Hope you get some relief soon. Sounds scary! Hopefully SOMETHING will work soon. Hmmm…. once I was in holland and I went to this place called Venlo, which has natural sulpher spring waters with ‘therapeutic properties’. It cured my hangnails and solved the problem for about 5 years now. Maybe you could go to Venlo and try it out? Hang around a pool, float for hours, lounge with some really cute dudes with european accents? I don’t know if it’d cure your headache but well, it’d be a great vacation! And, waaaaaaaaay better than getting poked with needles. My mom wasn’t a believer in Eastern medicine either, and she wound up pretty much hating acupuncture and not getting much out of it but she did the whole nasty tea thing and it completely cured her major insomnia. It did take a while, though, so you gotta give it some time. Also, I know you hate suggestions, but *have* you tried the chiropractor yet? I get horrible headaches all the time. I take a medication called Relpax 40mg, it is the closest thing to a miracle that I have ever discovered. It works at ending my headaches approximately 95% of the time. Maybe discuss it with your doctor. Working on the theory that laughter is the best medicine, have you seen the Funny Acupuncture Commercial on Youtube? OK, I wasn’t going to bug you about this, but the only way I can get rid of my headaches is to go to my wonderful chiropractor, Dr. Michael Gallagher – 571-1480. He’s on 96th Street just east of Keystone – 3510 E 96th Street to be exact. It will mean more forms and an xray or two, but this man is truly a GOOD chiropractor. I hope he can help you as much as he has helped me. I, too, feel for you. I used to severely suffer from headaches, mine were sinusitis-related, and my sinusitis was chronic because my sinus-entrances were way to tiny. I had a CT-scan proving that, and an operation to drill into my skull and make the entrances wider. I was so happy! The headches had gone! Well, most of them. I had also been suffering from migraines, but wasn’t diagnosed because of the ever-present sinusitis headache. I have, luckily, identified at least some of my migraine triggers so now I know which cleaning products never to buy and that I should never, ever drink champagne. I also have to be carefull with caffeine. If I have to go long without it, I get migraines, and if I start using it again, I also get migraines. I can’t go without my Diet Cola, so I stock up, but if we run out at the weekend and can’t go shopping, I know what’s going to happen. Still some triggers left to find though… And some unable to avoid, like the way to heavily sprayed perfume of ladies on the bus. A friend of mine has a chronic headache that was finally diagnosed as a trapped nerve behind her eye. There’s nothing they can do about it, she just has to manage her pain as best she can. But I hope you find relief, I really do. 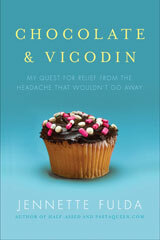 Its really well written (funny), yet might help you with your headache journey. Sorry about the server error, but I’m more sorry about the headache. Dear PQ, this post mostly leaves me wondering, ‘if she is this funny WITH a headache,what will she be like when it goes away?’ Thanks for seeing the fun and sharing your life! I’m gonna say a prayer for you. I just finished reading all your entries from the beginning which I started right after I saw you on the Early Show. There are not enough words to thank you for your inspiration. Every day I am tired and don’t want to work out, I just think of you doing training runs in the cold and I get my @ss up and get going. I am so glad I read all the entries because I really got the sense of your journey day by day week by week, month by month, pound by pound. Even though I have never met you, I find myself thinking of you as an example when I am talking to people as in, “I know this girl who…” This is strange for me- I am new to reading blogs. I thought of you when watching Grey’s Anatomy last week and they had a patient who had had a chronic headache at a pain level of 8 for the past 7 years. They found a way to fix it. It was the flood episode so maybe you have something so rare they had to use it in a Grey’s episode! Thanks for all the time and energy you put into your blog. It ends up being such a help and comfort and inspiration to many of us in the trenches. I thought of your headache during that Grey’s Anatomy episode too. I had chronic headaches for years and its such a bummer. I finally got relief after an ENT doctor prescribed Flonase for me. I use it daily and if I stop, my headaches return in a day or two. I hope you’re able to find relief soon. I love acupuncture – although I’ve never had the electricity kind. Now I’m a little sad. However – although they aren’t a Medical Doctor, they are Doctors of Oriental Medicine (usually), so they are still docs – licensed & everything. I love your site and I just had to chime in about the acupuncture…..I’ve had a chronic medical problem too and tried acupuncture b/c it was on my “last ditch effort” list as well. I actually toughed it out for about 6 sessions (the guy was cute, in that hippie unwashed long ponytail kind of way) but I didn’t notice any significant changes, and I was a little skeeved out by the herbs they were always pressing on me (even though the practitionner told me, it’s like eating a big bowl of soup with leafy greens! ok….). I would agree with the people above who told you that acupuncture does take a while, and I do know people who have been greatly helped by it, but it always made me feel more anxious (dizzy, etc.) afterward/during to really help me. Rant aside, DO NOT GO to a chiropractor! If they’re working with your neck it can be an especially dangerous practice. One of my parents was a doctor (radiologist) and refused to let any friends/family members/enemies visit the chriopractor’s office b/c of seeing the damage done to people’s bodies. Good luck and I hope you find something that works (and some relief) soon! On the Grey’s episode the guy had an inflamed nerve in his nose, which they were able to fix. Have you tried an ENT doctor? I had regular headaches for only 5 months! 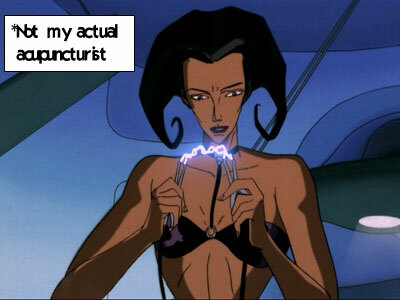 I am currently doing Accupuncture and find it works. My Accupuncturist is also an md and has done a 24 hour urine hormone test, found out mine are high (going through more testing now. I want to fix the problem not the symptoms). In addition to needles she does a thing where she hold my head in her hand and manipulates my scalp. Whatever she does, works almost better then the needles. I did have 5 sessions, one a week and now I am going a month between sessions. I go when I start to feel the headache come back. 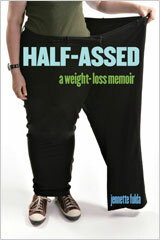 She also recommended a book TCM: Natural Guide to Weight Loss that lasts. The book is a little out there in some areas – like the diet but he has Qi Gong exercises that I notice less headaches when I do. (Yoga doesn’t seem to make as much difference). Keep us updated on your headaches. I need to know what else to try if mine come back!! Good luck. I’ve heard that headaches can sometimes be extremely hard to get rid of. What a nuisance! It’s obviously a big deal if you’ve been so many different appointments to try to get rid of them. I hope they go away soon! Hmm… I get headaches pretty often but they never last more than a couple of days at most. I have heard that getting my wisdom teeth out might help, but I am too much of a baby to actually go through with the procedure. Something about anesthesia makes me nervous. I hope something works for you – and soon. your comment about chiropractors is so unhelpful. even if you had worded it with “do a bit of research before you go to a chiropractor…ask friends/co workers who the recommend etc)…. there are some wonderful chiropractors out there..who have helped thousands of people. they should not be bad mouthed because of the few rotten apples in the same field. Nutrasweet/aspartame (found in virtually every diet soda & sugar-free product) causes a horrible, chronic headache for me. I used to love Diet Coke. I still miss it. But I’m allergic to the aspartame. Good luck! I’m glad this horrible headache hasn’t stopped you from writing. You’re a really talented writer! Good luck Pasta Queen! I’m sorry to hear you’re in so much pain. @Amy – I’m going to blame all typos on my pain. Thanks, for catching that. I really am enjoying reading your posts about your LIFE and glad you expanded beyond just weight loss/fitness/food. I know that you are sick and tired of people giving you their grandpa’s old headache medicine story that healed their headache; and I am so sorry to do this to you but as this has worked for myself, and a couple of other close friends–I must share. Read ,”Heal your Headache,” by David Buchholz! It is pretty much a diet…or in my case a total lifestyle change. He gives advice such as avoiding sugar, splenda, pestisides, etc. It is an informative book and has brought my headaches down to about once a week. I think its worth a try. I am praying for you to feel better! Please give this a try! So you don’t like suggestions but I’m going to make 2. Repeat on the chiropractor suggestion. Also, I get headache relief from getting hydrated. Make sure to sip water all day.